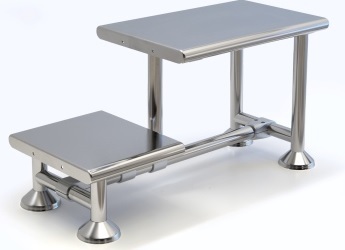 These gowning benches from Palbam Class are made from type 304 stainless steel with an electropolished finish that makes them easy to wipe down and keep clean. Palbam Class is world renowned for its superb gownroom furniture range. All the products are designed to the highest cleanroom, ergonomic and visual specifications. All products are manufactured from carefully selected type 304 stainless steel with an electropolished finish. Please browse our selection below or contact us if you have any custom requests for Palbam.